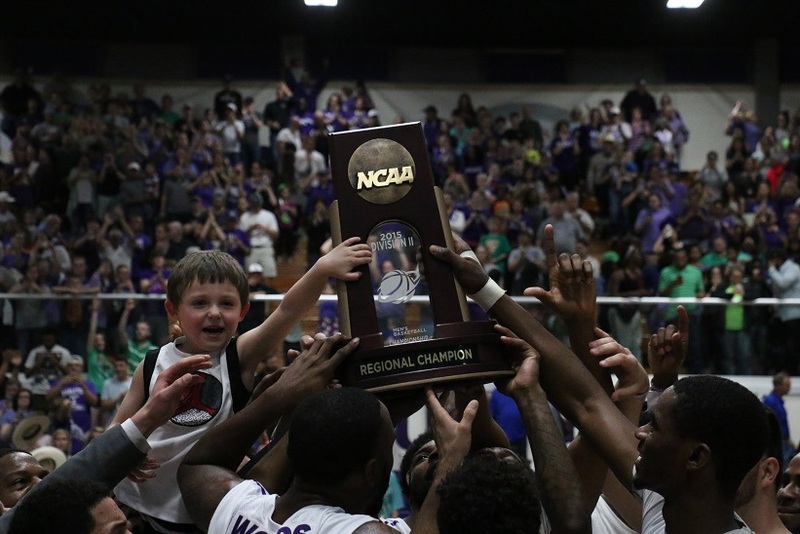 STEHENVILLE – Webster’s dictionary defines the words instant and classic as being “a very short period of time” that “serves as a standard of excellence.” Tarleton State’s 66-64 Sweet 16 victory over Angelo State was nothing short of an instant classic. 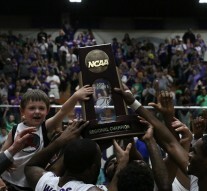 In front of one of the largest crowds in the the history of Wisdom Gym, Tarleton State punched its ticket to the Elite Eight in Evansville, Indiana. The win was the thirtieth of the season for coach Lonn Reisman’s team, which sets a Tarleton State school record for wins in a season. The Texans are advancing to the Elite Eight for the third time in school history and the first time since 2002-03. The No. 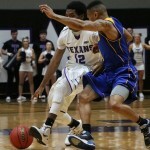 7 (30-3) Tarleton State University Texans entered the game as the No. 3 scoring defense in the nation, while the No. 19 (28-6) Angelo State University Rams entered as the No. 2 scoring team and the No. 2 scoring defense in the region. Most wins and losses can be traced to one team’s significant advantage in a multitude of statistical categories. Monday’s game had no such obvious pattern. The two teams had the exact same number of points in the paint (32), points off of turnovers (3), second half points (37) and blocks (2). Having a couple of stats match-up is not exactly an anomaly, in fact, it is quite common. The crazy ‘stat’ in this game, is very much extraordinary. What is it? The separation of four. The field goals made, field goals attempted, three pointers made, free throws attempted, offensive rebounds, defensive rebounds, total rebounds, personal fouls, assists, turnovers, steals, second-chance points, fast-break points, field goal percentages, three-point percentages and the final score were all within four digits or less of one another. However, there are three statistical categories that standout and proved crucial in the win – free throws, bench points and minutes. First, the bench points. 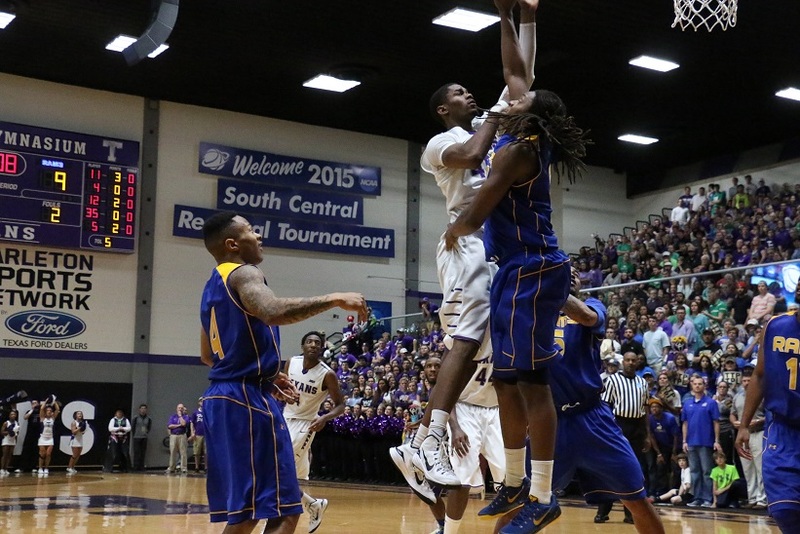 Angelo State scored 64 points on the night, and 58 of those came from their starting five. In fact, its bench accounted for only 37 of the 200 total minutes played. That means the starters were on the court for an average of 32.6 minutes each, and all played 29 minutes or more. Why is that significant? Keep reading, and keep up. On the flipside, the Texans’ bench was able to triple the output of the Rams’ by accounting for eighteen points. Outside of Michael Hardge and Mo Lee, the Texans averaged exactly 22 minutes of playing time each. Low minutes plus a continuous rotation equals fresh legs, it’s simple math. Still not making sense? 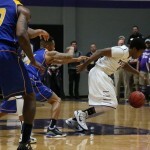 OK. Let’s take a look at when and how the Tarleton State bench scored. His basket pulled the Texans to within two points with less than five minutes to play in the half. Lee, Davene Carter and Damion Clemons checked back in after three-plus minutes of rest and the Texans down four. Seem important yet? No? When athletes begin to tire, the first thing to go is the strength in their lower bodies, and the second is their concentration. Both are vital to consistent play on the hardwood, but especially free throw shooting. 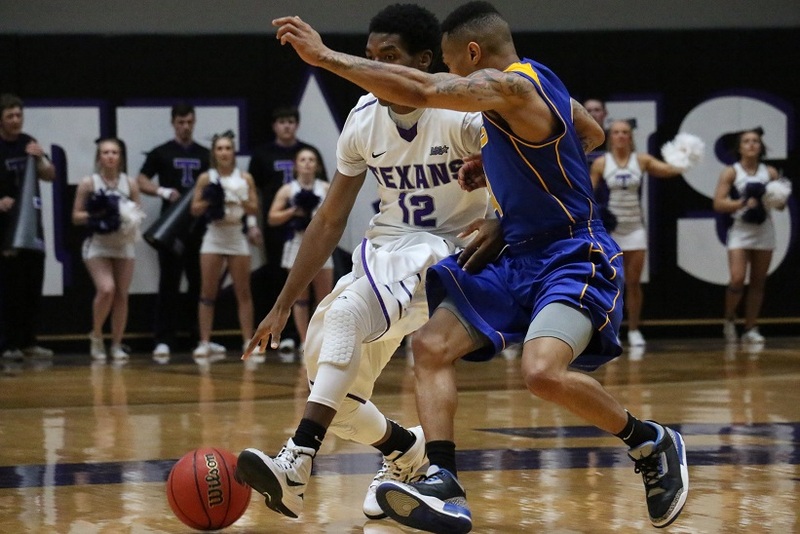 Tarleton State outscored Angelo State 10-4 over the final three minutes of the first half while both teams managed only two field goals a piece. The difference? The Texans went 6-7 from the free throw line. Hardge, Clemons and Lee combined for the last five points of the half, and all five points were scored from the charity stripe. This ten to four scoring run, fueled by free throws from players with fresh legs, gave the Texans a 29-27 halftime lead. Need more proof? Over the final five minutes of the game, Angelo State went just two of seven from the line, including two straight misses by Jones with ten seconds left and his team trailing by one. Jones is a career seventy-percent free throw shooter who played 34 hard minutes on Monday at Wisdom. Now back to the simple math. Thirty-four minutes up and down the court guarding Hardge and Riddick plus the hostile capacity crowd’s deafening yells equals tired legs and an easily broken concentration. Tired legs equals poor shots, add in being easily distraction for lack of concentration and you have a perfect storm for throwing up bricks when the game is on the line. 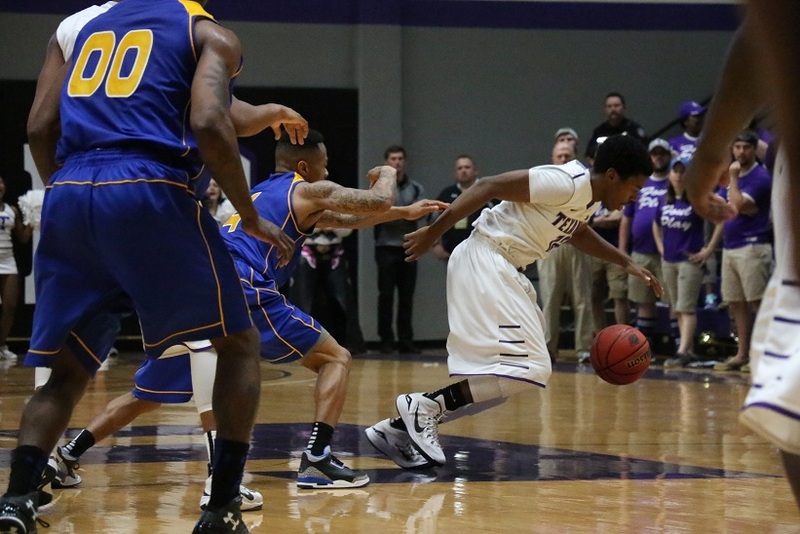 EJ Reed, who only played 13 minutes in each half, drained the two biggest free throws of his career on the ensuing Tarleton State possession and sealed the win. 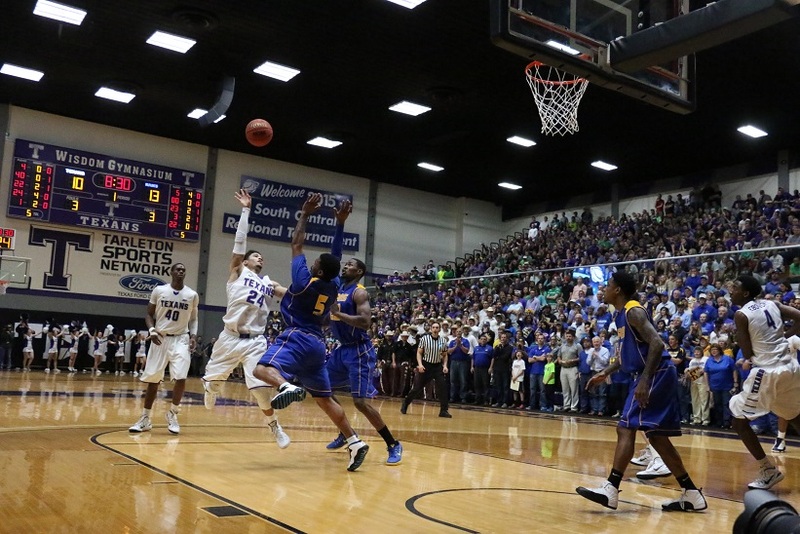 Prior to the game, Associate Head Coach Chris Reisman posted on Facebook that this was “the biggest game….ever at Wisdom Gym.” I whole-heartedly agree. 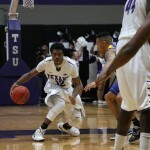 The 2014-15 Tarleton State University Texans are more than two players deep, they are a complete team in every sense of the word. A team that is relentless on defense, ferocious above the rim, unselfish with the ball and just three wins away from the first national title in school history. 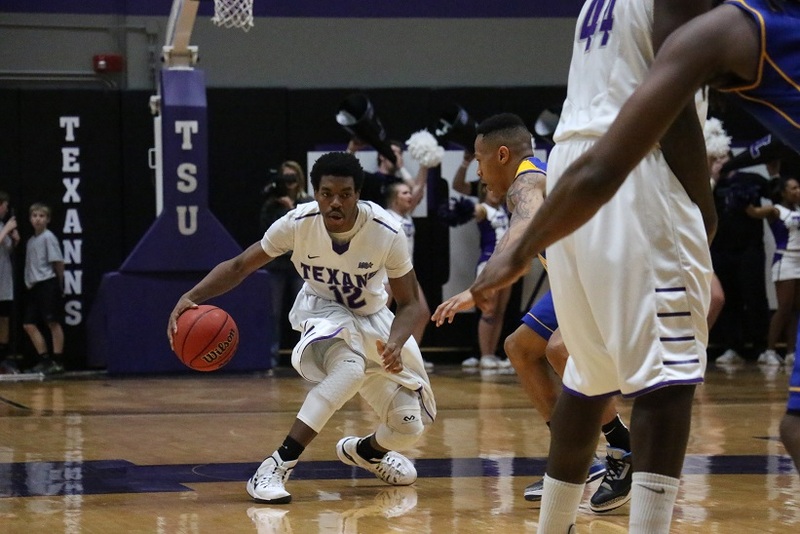 The Texans are set to depart from Stephenville for the Ford Center in Evansville on Sunday to play the University of Mount Olive on Wednesday, March 25 at 1 p.m.
Texan News will be there and will be providing you with up-to-the-minute photos, a live-blog, game recaps, and analysis. The game will also be aired on Northland channel 9 for those of you who cannot make it to Indiana.